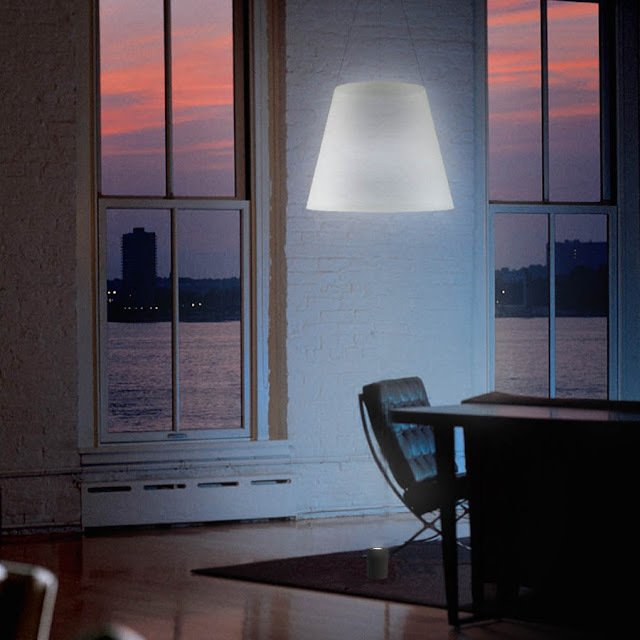 Shade Pendant Light from FLOS created by Paul Cocksedge provides a warm ambient light in your house. The Shade lamp which I made for Flos lighting started as a purely practical problem: how to rid ourselves of the clutter usually connected to light fittings. The solution actually turned out to be quite mysterious, almost dreamlike. It utilizes both floor and ceiling, but it appears connected to neither..! - Paul Cocksedge. The suspended high-end Flos pendant lights with Japanese crinkled paper shades are illuminated from below with a floor-standing LED spot light. The Flos Shade lamps available from Stardust.com features a slender aluminum tubular floor-standing spot light that is equipped with LED lights that emit a warm 3000 lm upward beam of light. Simply place the spot light below the shade and illuminate when needed. 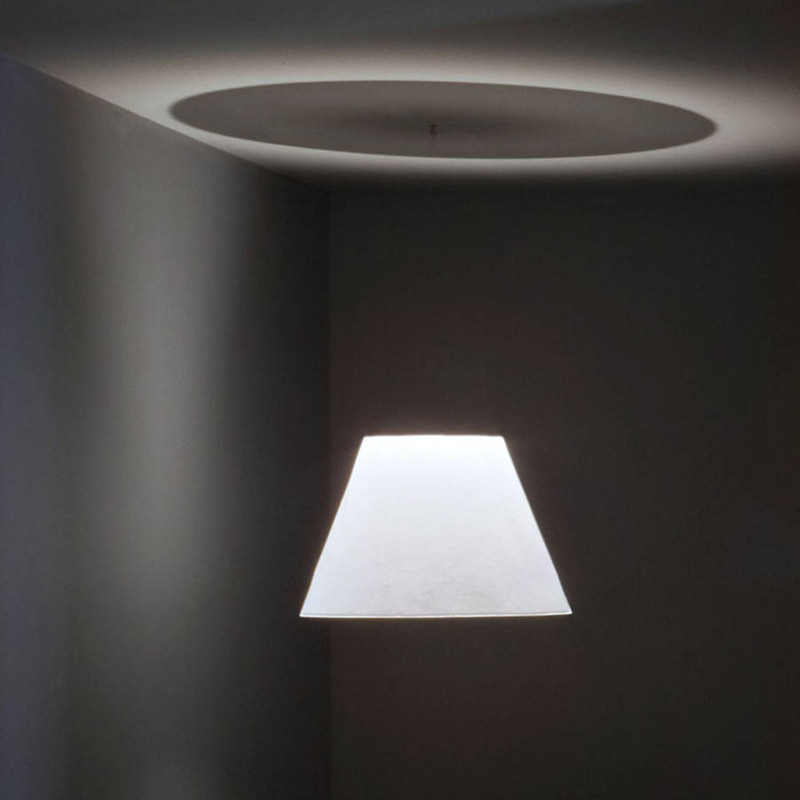 Easily installed in a matter of minutes, Shade can be used as a centrepiece in a room or as an off-centre focus to light up darker corners, shadow-filled corridors and intimate alcoves. You can install Flos Shade Lamps so they appear to be floating in your home" next-to-invisible wires are crafted from capilarry-thin wires. The SHADE is fashioned from Japanese paper. Due to its filigree appearance and the sensitive Japanese paper materials, it is not suitable for rooms with high humidity or when installed in close proximity to a ceiling fan. Do not install under a ceiling vent/duct. 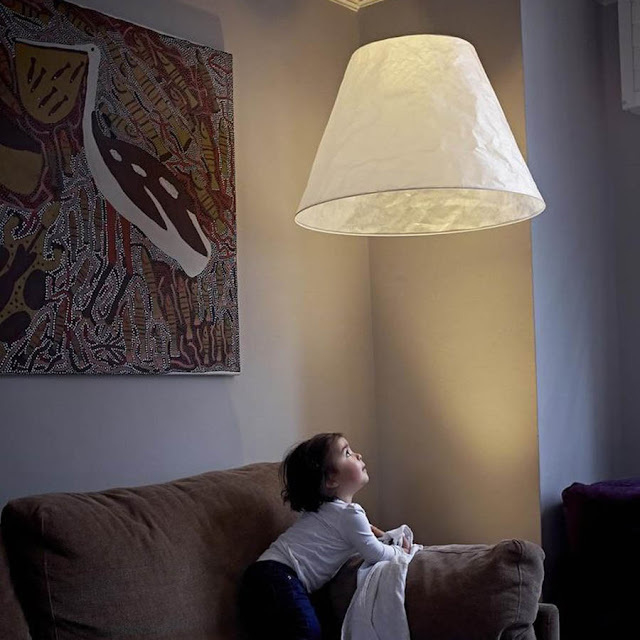 Shade redefined the word "lampshade"; and its fixed perspective and is an effortless way to have warm ambient light with a touch of surrealism. The magic of Shade is achieved by avoiding the conventional way of using mains power from the ceiling, and with it intrusive fittings and flex. 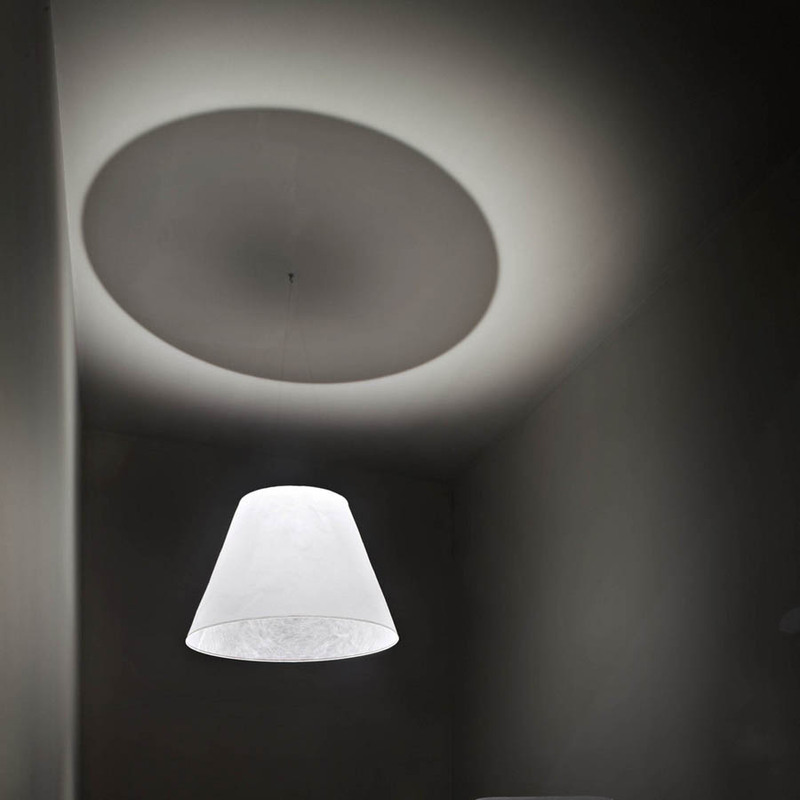 Created for Flos by London-based designer Paul Cocksedge, the genre-defying Shade provided a refreshing highlight to the endangered lampshade. Instead, power derives from an LED floor fitting shining an uplight into the paper shade, which in turn is suspended from the ceiling with next-to-invisible, capillary-thin wires. Paul Cocksedge adds: "Shade has an almost dream-like mystery. It utilizes floor and ceiling both, but appears unconnected to either...!" 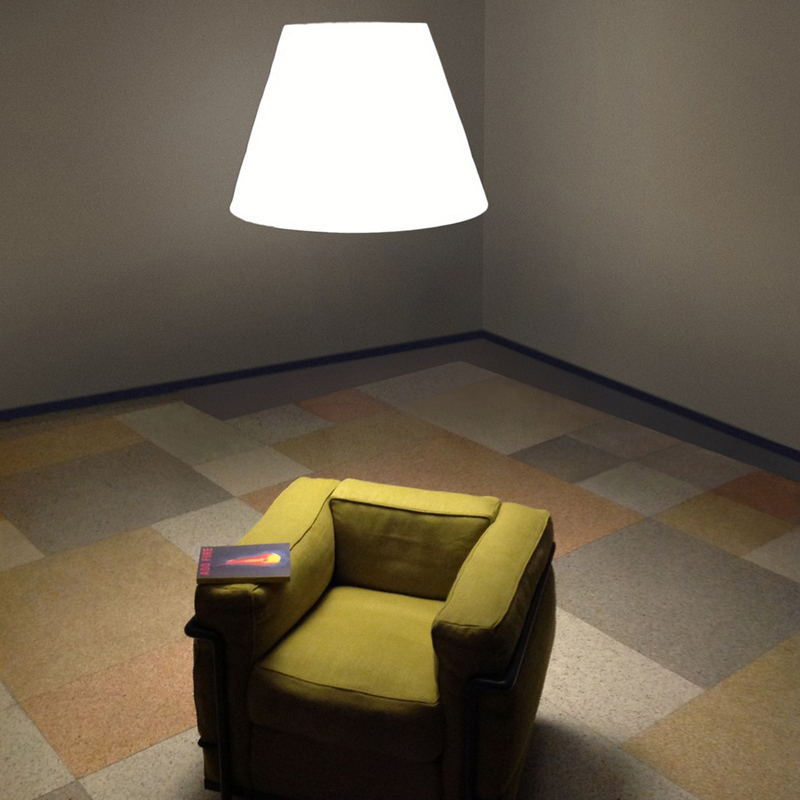 Technical and Product Description SHADE floor lamp providing diffused light.